A gang of colourful ghosts transforms a drab house in a new Ikea campaign encouraging people to express their personalities through their home interiors. Launching today, the marketing campaign urges the nation to be a "maverick with fabric" and use Ikea textiles to transform their life at home. This idea is brought to life with an ad by Mother about a group of ghosts, made from plain white sheets, who are hosting a dull party. But a gang of bright and bold spooks, created from Ikea fabrics, gatecrashes the party and livens it up, until all the ghosts are dancing and headbanging to a loud anthem. The festivities end when the homeowners arrive back unexpectedly. The quick-thinking ghosts collapse down into an array of colourful textiles, brightening the once boring home. The ad was directed by Blink’s Dougal Wilson, who previously directed Ikea’s 2015 "T-shirts" spot about garments that make a long journey home as if they are birds. 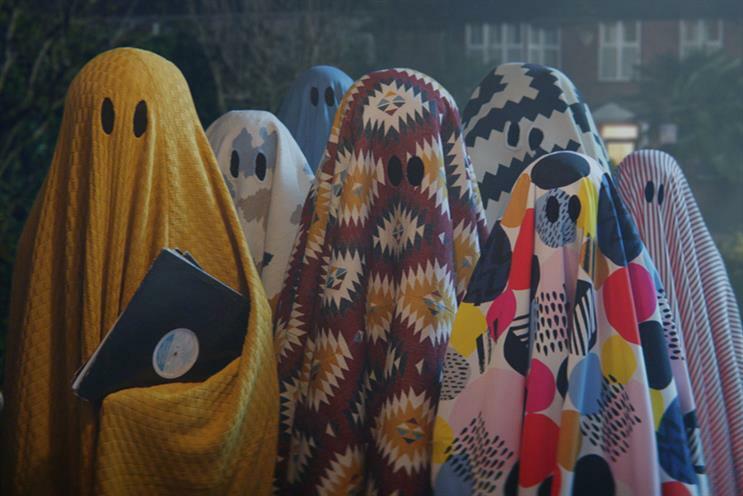 Laurent Tiersen, Ikea’s UK and Ireland marketing manager, called "Ghosts" one of his favourite campaigns from the brand because it is a "perfect metaphor" of self-expression at home. The retailer wants people to "look at their homes differently" and become more confident in experimenting with textiles, he added. "We are a nation of people who are normally very creative in all areas, from tech to fashion and art and music, but when we look at the homes we live in, the main colours are white and beige," Tiersen said. "We know from our research that the visual and tactile aspects of materials have an impact on your mood, so if you add touches of colour and personality you will have a better life at home." Along with the film, Ikea has created a music video with the band Teleman, which showcases various textiles changing to the song’s beat. The video will run on YouTube and on Instagram Stories for the first time. The campaign will include targeted emails and an online personality test where customers can find out which Ikea textiles best suit their personality. Ikea will also collaborate with a Savile Row tailor who will make suits with the brand’s fabrics. This partnership illustrates the point that "we should dress our homes with the same effort with which we dress ourselves," Tiersen said. Vizeum handled media planning and buying for the campaign, which is running across TV, cinema, print, outdoor and social media.